The Bronx students proudly pose with their robot creations. 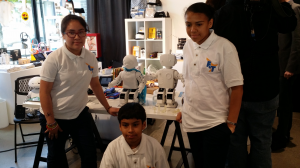 Thanks to a partnership between Intel, Lehman College and the Department of Education, three South Bronx students from High School/Middle School 223, designed their own robots that used a 3D printer to bring their creations to life. The pilot program with Lehman, Students and Robots, is part of Intel’s 21st Century Robot Project, which seeks to develop an open source 3D printable robot platform. The student participants—Anjeliqe Martinez, 12-years-old; Yaritza Montiel, 12-years-old; Melvin Estudillo, 11-years-old—are all seventh graders at H.S./M.S. 223 and were selected by Intel after submitting their own original ideas to the 21st Century Robot team. The ongoing partnership between Lehman College and Intel is just one of the ways the College is establishing a STEM (science, technology, engineering, mathematics) pipeline for local students. Since 2013 Intel has sponsored the Bronx SciFest, which allows Bronx high schoolers a chance to develop their own scientific research under the guidance of college professors with the goal of helping them establish careers in the STEM fields.